Shelby Landers and Matthew Mangold, both students at Capital Area Career Center, nail siding to the front of the house they're building in the trades class. Landers says he's happy to get out of the classroom and get more handson experience. He says he doesn’t plan to go to college, like many of his classmates. Getting the job he wants - in carpentry or machine operation - would mean getting a union apprenticeship instead. 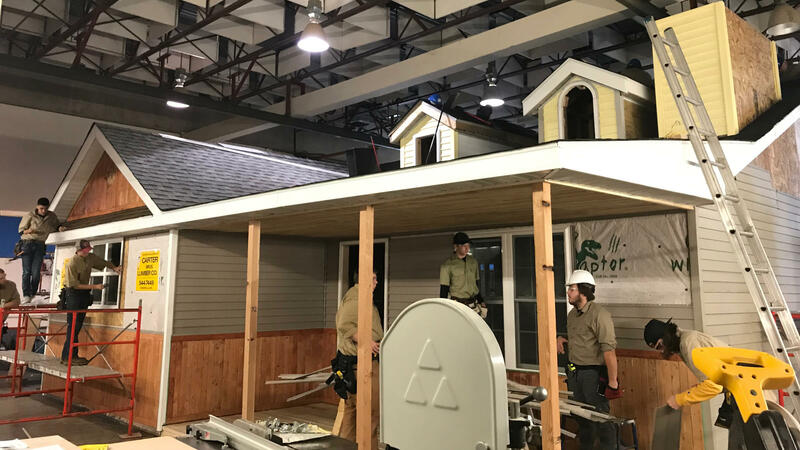 Students at Capital Area Career Center in Springfield are building a house in the trades class. “Parents come in and say, my kid don't want to go to college. And when they said that, they said it like it was a bad thing,” said Wes Aymer, principal at Capital Area Career Center. But, Kate Blosveren Kreamer - deputy director of Advance CTE - a national advocacy group for career and technical education programs like the one in Springfield - points out that demand for skilled workers is growing and expanding to new fields. “The labor force is changing so rapidly, and there are so many new opportunities and new sectors and new careers that many years ago, we didn't know how to prepare individuals for them,” she said. Eugene Phillips is one example. 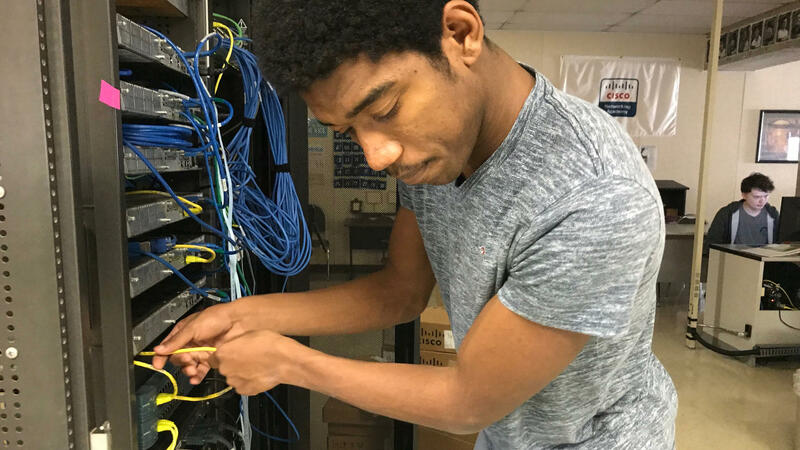 He’s studying computer networking at CACC -- not to find a job right out of high school, but to help figure out which career path is right for him. Eugene Phillips, a student in the computer networking class at Capital Area Career Center, checks wires connected to router his classmates are using. “I have always been programming. I've always (been) messing around taking like PlayStation apart and things like that (since) I was in middle school, I built my computer and I still use it to this day,” he said. He says the CACC program has helped him figure out which jobs are available in the information technology field. Those jobs continue to grow - and industry estimates put the number of needed workers in cybersecurity at almost two million worldwide by 2022. In Illinois, computer-related jobs are expected to grow by nearly 20,000 in the next eight years. For Phillips, it’s not technical training or college - it’s both. He has already earned an industry-recognized certification that would qualify him for some jobs. And he plans to get a bachelor's degree and maybe eventually a master’s. “Having that degree will open up doors for me that I don't have without a degree,” he said.